Sydney-based Staging Rentals and Construction Services has added another two new Hinos to its fleet - a 500 Series Pantech with side-curtains for the bigger jobs, and a 300 Series light-duty truck for smaller loads. These trucks join three Hino Dutros, an older 300 Series model and a Hino Ranger equipped with a crane. While the older Hinos have covered long distances, they're still out there doing their job reliably, and they have inspired Staging Rentals to continue its association with the brand. "We're running a 'round the clock business here, and our trucks are used to being loaded to full capacity the whole time," Sales and Operations Manager Michael Stokes says. "And the Hinos just do their job. Even though they get used and abused, we've never had an issue with them. Their endurance is just great. "The creature comforts have improved so much. The new ISRI driver's seat just makes driving so much more comfortable. The boys love the entertainment system too, but they shouldn't have any time for watching DVDs!" The Hino 500's ease of driving is appreciated by driver and staging assembler Vojta Parak. "It's really just like driving a very big car. The gears shift easily and it's just so smooth," he says. "Our older Hinos are still good to drive and they're strong and reliable, but I love driving the new ones." It's true that Staging Rentals' truck fleet has helped the business come a long way, and with the new 300 and 500 Series Hinos on the fleet, the company is now travelling in absolute comfort. Born out of hard rock and hard work, Staging Rentals and Construction Services is a unique business, providing stages, drapes and construction to the event and entertainment industry. 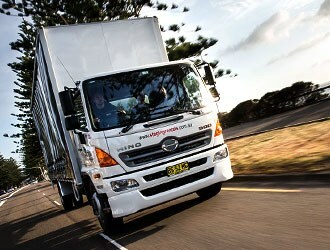 It has grown from a small Sydney-based outfit to now also having operations in Brisbane and Melbourne, and the majority of its truck fleet is made up of various Hino models including Dutros, a Ranger, 300 and 500 Series. The company was born out of hard work when founder and director Meri Took began providing staging services to the Sydney pub circuit after learning the ropes as a roadie for legendary Aussie rock band Cold Chisel. Staging Rentals' truck fleet is a far cry from Took's original 'one man and a trailer' approach. But the hard work element is still very much there. "The business wouldn't survive without a dependable truck fleet to move equipment to and from product launches," Managing Director David Comer says. "The fleet are moving our people and equipment to our client's corporate events, exhibitions, television productions, theatres and fashion shows. We average 10 jobs a day. Just recently we've had the NRL grand final, Fashion Week, the Motor Show, you name it." Over its 22 years of existence the company has put a lot of work into making performers on stages, and models on catwalks, appear in their best light by providing the staging equipment - something most audiences wouldn't even think twice about. Hard work is a constant at Staging Rentals. And so are the interesting experiences that can be had when working in the event and entertainment industry. "The guys get to see some very interesting things out on the road. If only those trucks of ours could talk!" Stokes says.